FLEXIS (Flexible Integrated Energy Systems) aims to de-risk decarbonisation by enabling low carbon transport, integrating renewables into the grid and developing reliable means of carbon capture and storage. Its unique approach models energy flows and uses social science expertise to understand public perception of new energy technologies. FLEXIS is a consortium of five strategic partners – Cardiff University, Swansea University, The University of South Wales, Neath Port Talbot Borough Council and Tata Steel UK. Funded to the tune of £24m, with just over £15m from the European Regional Development Fund via the Welsh Government, the vision of the five-year project is to achieve a resilient, affordable, secure energy system across Wales with the potential for global application. 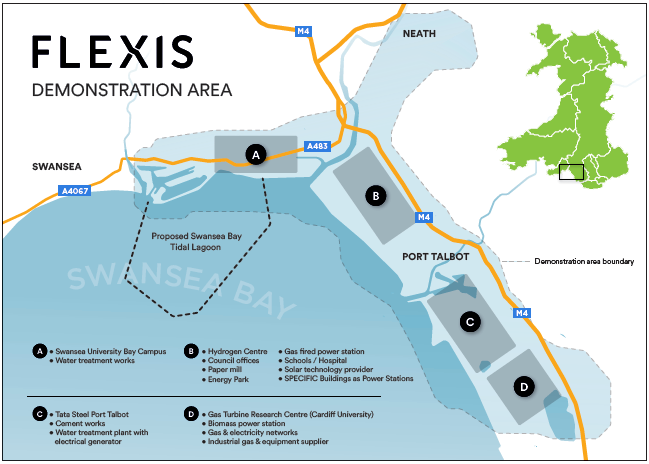 FLEXIS is applying its research to a physical site based in Neath Port Talbot. Real data from the area’s energy producers and consumers (including the local community, Tata Steel Port Talbot and local industry as well as the Pen y Cymoedd wind farm) is modelled to work out how to integrate, store and supply smart, clean energy. FLEXIS is contributing academic expertise to Neath Port Talbot Borough Council’s roadmap for a low carbon smart future. Plans include further development of low emission vehicles, making Port Talbot a smart low carbon town and a new £7m innovation building in Baglan Bay Energy Park which will capture excess electricity to produce hydrogen to power transport. The scope of the demonstration area makes it the largest multi-vector demonstration region in the UK. FLEXIS facilities include Cardiff University’s Centre for Integrated Renewable Energy Generation and Supply (CIREGS), a multidisciplinary engineering group with international expertise in the supply and transmission of energy, and its Gas Turbine Research Centre, which enables novel research into new gas turbine combustion systems, components and fuels. As well as The Energy Safety Research Institute (ESRI)’s state-of-the-art laboratories at Swansea University’s £450m Bay Campus, FLEXIS also benefits from the University of South Wales’ Hydrogen Centre, a platform for renewable hydrogen production and storage. 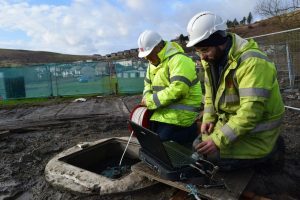 Research has translated into a mine water heating project, a world-first ammonia-storage-to-wind-power demonstrator and the UK’s first Medium Voltage DC link, all with industry and local government partnerships.